I confess that I am not a card-maker! When I'm in a scrapbooking or paper crafting store I find people usually ask if I make cards and are surprised when I say no. I'm not sure what it is, I just have a really hard time. But, I needed to make a thank you card recently, and was so pleased with how quickly this one worked up -- AND, how much I totally love it! 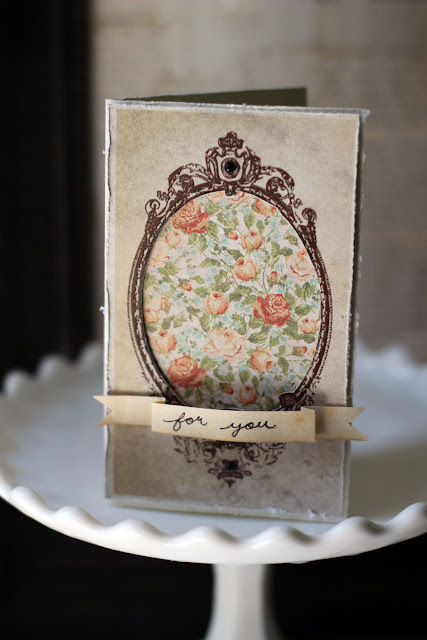 I used a sweet little glossy vintage frame cut out from a piece of Kaisercraft paper. I cut out the image that was originally in the frame -- a vintage looking image of black bears -- and backed the opening with this sweet shabby rose print, also by Kaisercraft. I love the way the two pieces paired together! (I did set the bear image aside for use on another project... I think I have the perfect home for it, in a mini album I'm working on about a trip to the science museum.) I set some shiny black pearls by Kaisercraft into the top and bottom ornate design in the frame, to add just a bit of dimension and extra shine to the card front. I handwrote a sentiment onto a piece of vintage book page and folded it into a banner. Seriously, I love this card. If all my cards could look like this, and be this easy, I'd be a card maker. For sure.